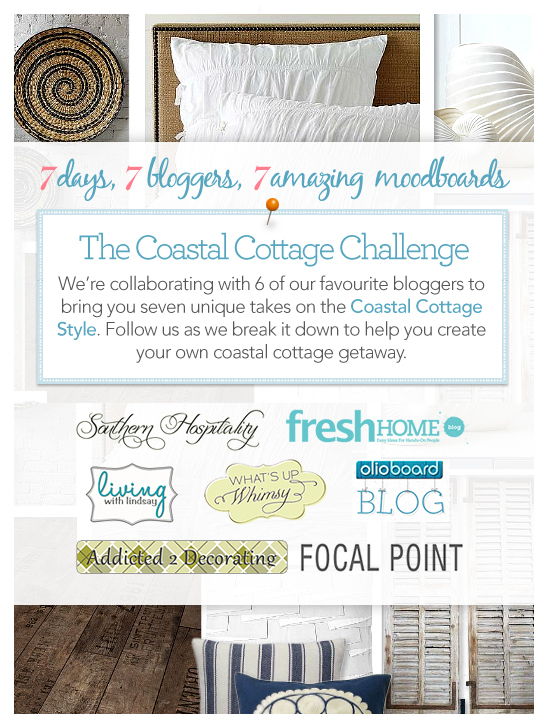 We have come to the end of our Coastal Cottage Challenge. I hope everyone has had as much fun with this as I have. It has been a pleasure to collaborate with such talented ladies and to see each one of our unique takes on this sea side style. For those that have followed along, I hope you were able to gather some great tips on pulling off this look. 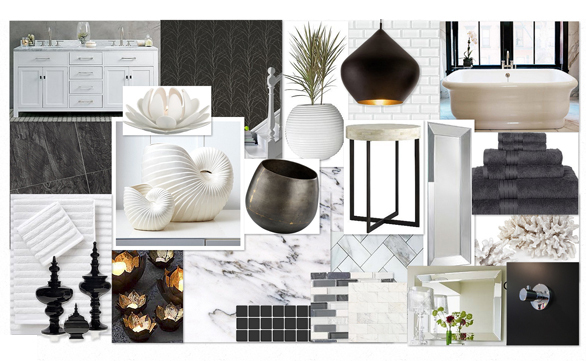 Here’s a recap on all the fantastic designs and some of my favourite elements from each moodboard. Day 1: Lynda’s studio design is definitely a space I could lose hours in. I love the wall art made up of a variety of paint swatches. 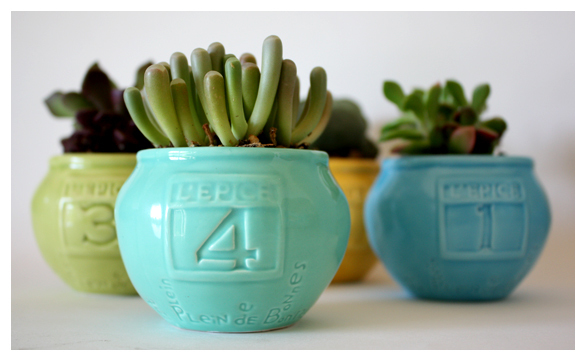 It’s such a different and fun idea for art and is particularly well suited for a studio space. The shelving units on wheels would be ideal for a studio as everything should be easy to move around to accommodate projects of all sizes. I also like the contrast created in the design by the crisp, clean white sofa paired against the more aged and worn pieces. Day 2: I couldn’t agree more with Lindsay when she said the desk really made the design. It is such a great find. The mix of vintage and modern elements makes this space feel as if it was created over years of carefully collecting the right pieces. 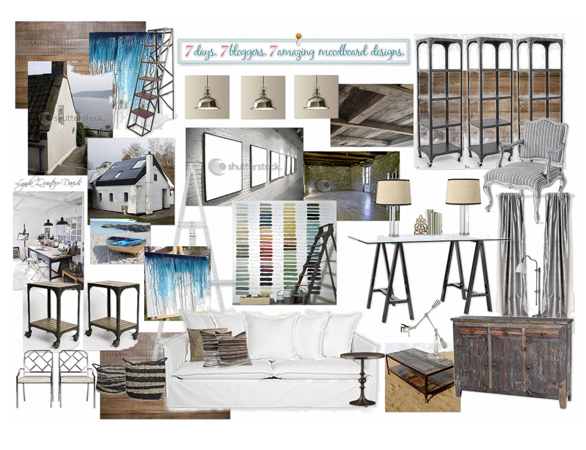 My favourite elements would have to be the antiqued white shelf, blue shuttered desk, three leg table lamp and painted blue glass bottle. Beautifully done Lindsay! 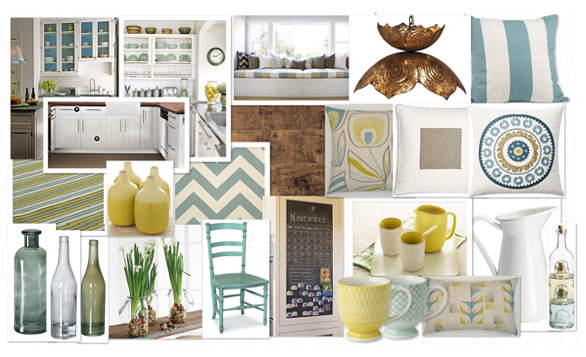 Day 3: What I enjoy most about Rhoda’s design is that she didn’t stick with the typical blue-green colour scheme that the Coastal Cottage is known for. 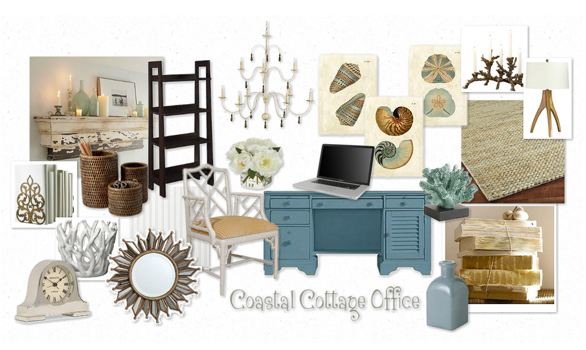 Not to say I have anything against this palette (as you can see by my own design), it’s just nice to see a fresh take on the Coastal Cottage style. 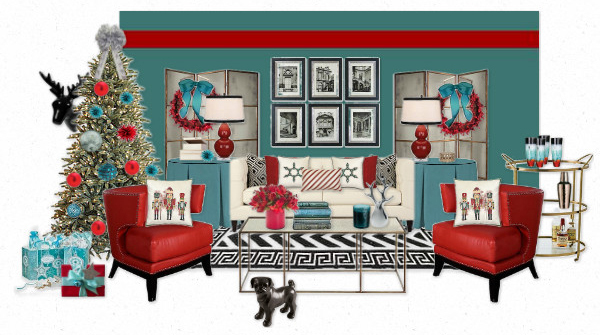 The bold hits of red liven up the space, while adding nice contrast to the teal accents. The beautiful rug, which I believe was the inspiration for the space, helps tie it all together. 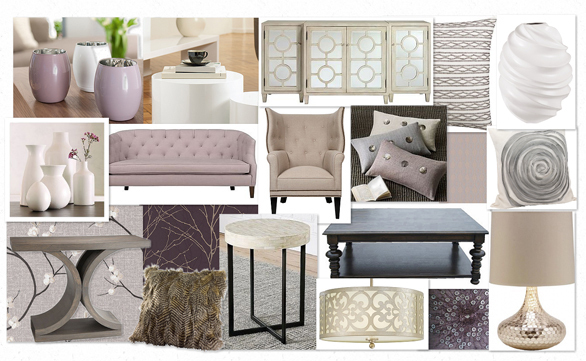 If I had to choose a favourite piece, it would be the coffee table. I love it when random items are transformed into functioning furniture. It just makes for a more interesting design, don’t you think? Day 4: What’s not to love here. 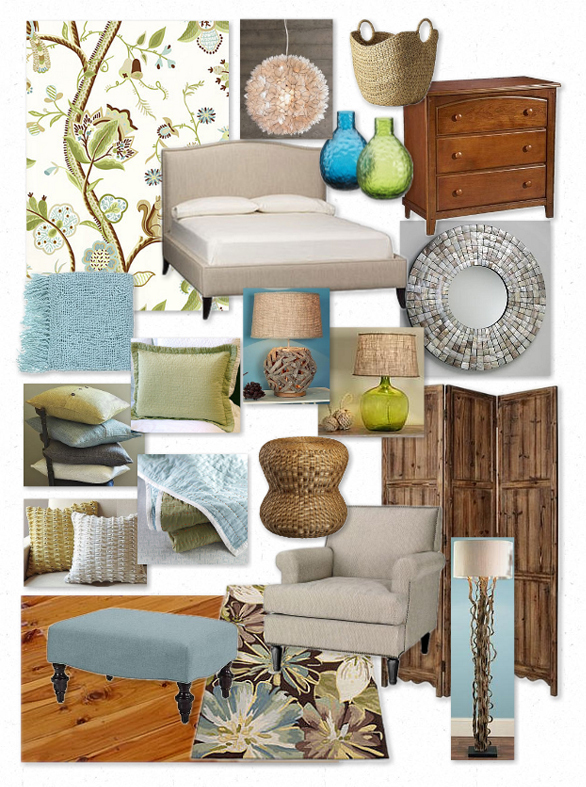 The natural materials, glass accents and colour scheme really bring the beach theme to life in this bedroom design. 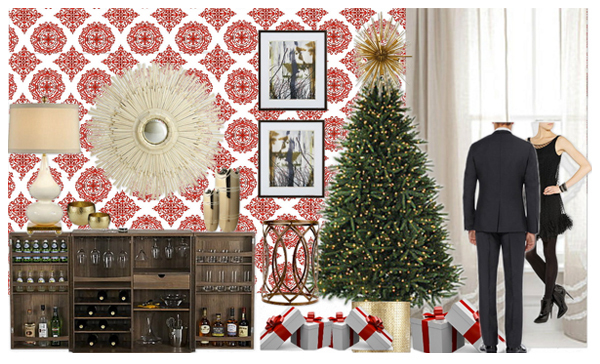 The show-stopping wallpaper is definitely a great choice. 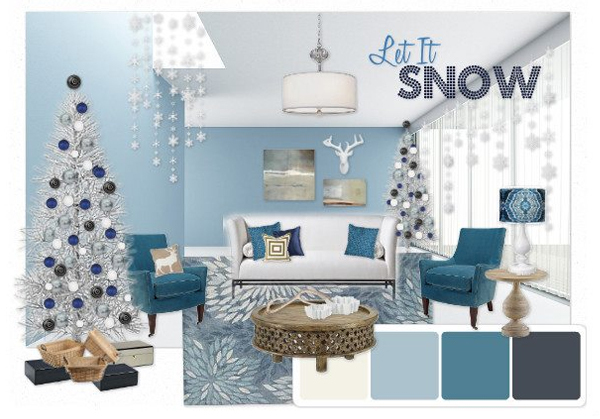 The fun, bold pattern helps tie in all the colours in this design for a polished, finished look. Love your work Kristi. 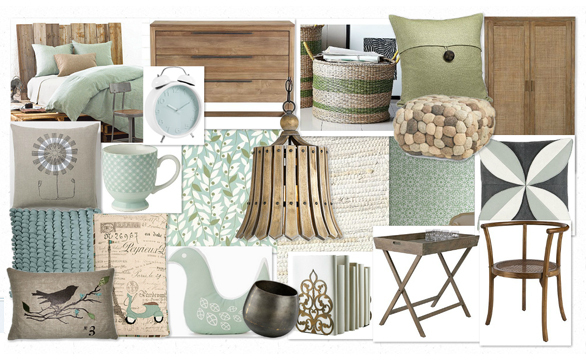 Day 5: The mash up of items in this moodboard is completely what makes the design. 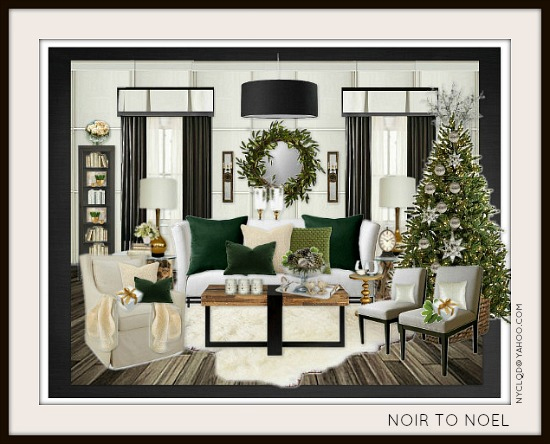 Shannon says it best ‘When putting together a dining room, my rule of thumb is, always go for a more eclectic look – one style for the table, different style for the chairs and a mismatch of different textures – jute, wood, fabric, etc.’ I completely agree. When you go with a complete set you lose the element of ‘happy surprises’. Changing up the style of table from your chairs, or incorporating multiple styles of chairs can give your dining set loads of character, and more of a personal touch. Try it yourself and let us know how it worked for you. Day 6: I said it before and I’ll say it again. Happiness is colour and LOTS of it. Rachel’s design is the perfect example. 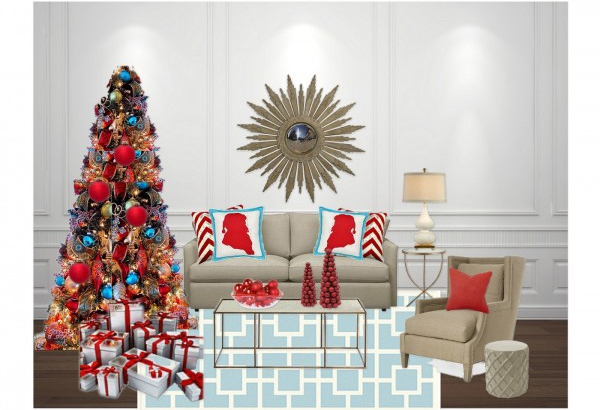 Here is another case where teal and red go beautifully together. While the design is simple and uncluttered it still packs a punch. The white backdrop allows the bold coloured elements (in a mix of modern and vintage) to set the mood for this summery escape. Oh, and I love the addition of the rain boots. Day 7: My favourite part of my kitchen design is the addition of the window seat. I’m a big fan of bold patterns and great fabrics. More often then not, they are something that gets put aside when designing a kitchen because kitchens are usually more focused on the harder surfaced items. Whether it is a tablecloth, curtains, seat covers or wall dressings, I think there is a place in the kitchen for fabrics and the more you add, the cozier your kitchen will feel. The kitchen is supposed to be the heart of the home. Make it a comfortable one. That’s it. I hope you enjoyed this challenge. 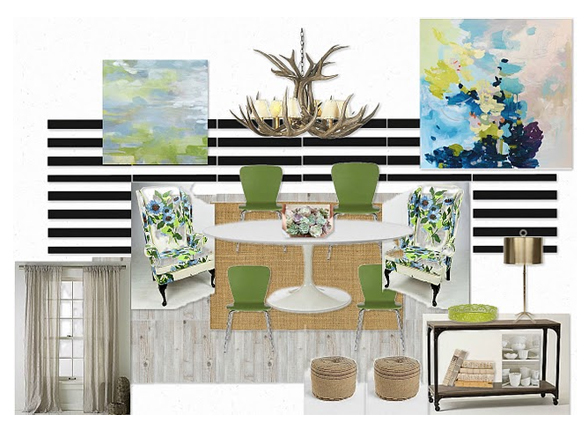 We had a lot of fun creating these designs and we hope this collaboration has helped you in creating your very own sea side escape! A few months ago, I started a weekly sewing night with a group of girlfriends. 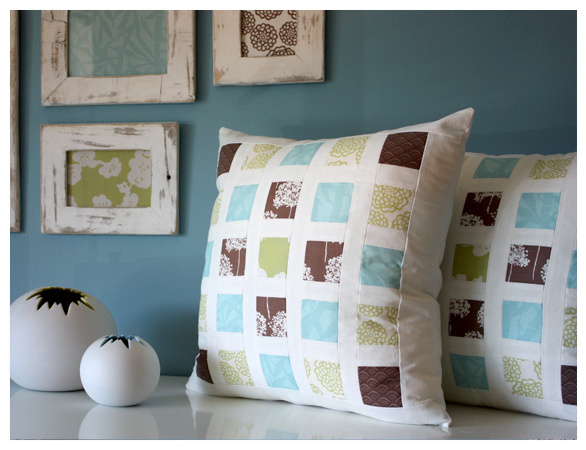 These pillows are my latest creations. I have to say I’m pretty proud of how they turned out, so I’ve decided to share them with you guys. I must admit I got a little carried way by all the fun patterns at the fabric store and bought way too much. Since I don’t need a dozen pillows to decorate my bed, I opted to instead get creative and take the fun fabric and turn it into a whimsical art collection. These now sit above my bedroom dresser and tie in nicely with the new decorative bed pillows. 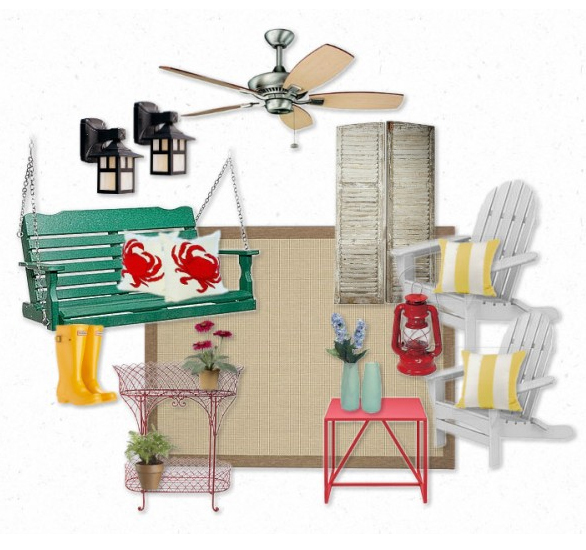 Try it out for yourself — it’s a cost effective way to add an instant cottage/country vibe to any space. 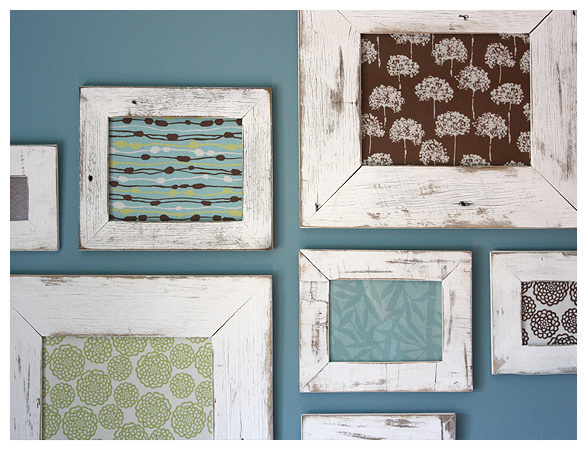 The weathered white frames definitely complete the look. 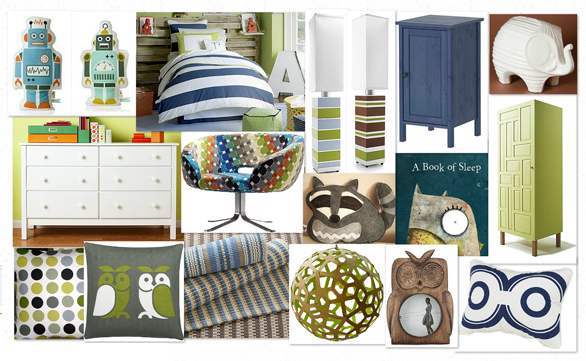 I’ve designed most spaces found in a house for this 30 moodboards in 30 days challenge, but had yet to design a nursery. So here it is. I like the no frills approach to this nursery. Not to knock frills or anything. They work for others, but not for me. 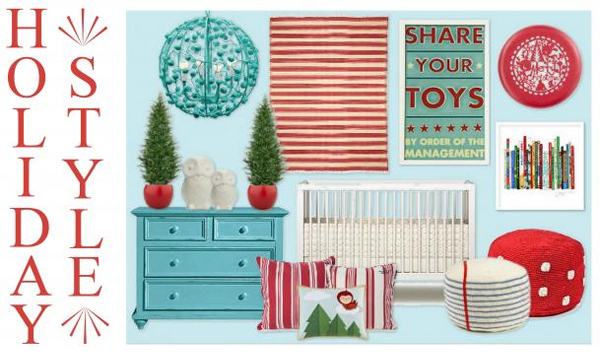 This more modern nursery is much more my style. 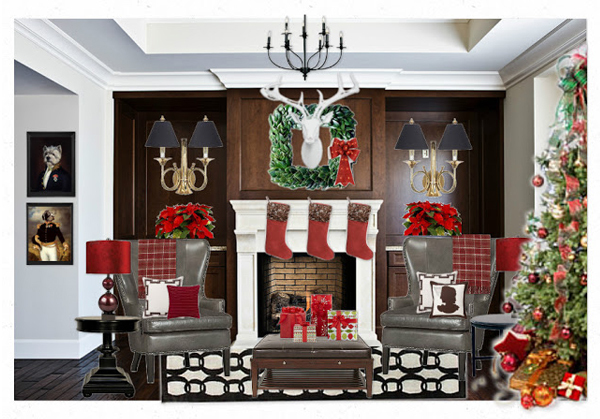 I like the clean lines and neutral colours of the furniture. 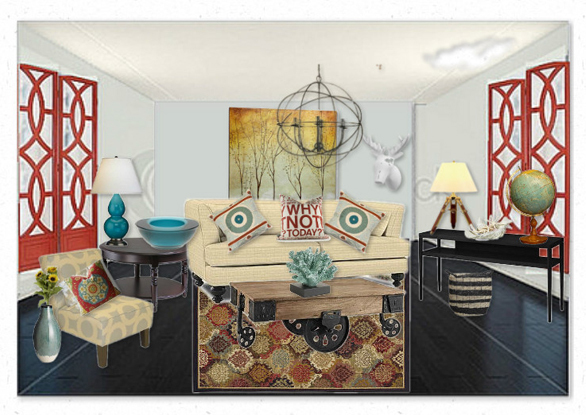 It allows all the fun accessories like the knitted monsters, artwork and accent pillows to take the spotlight. 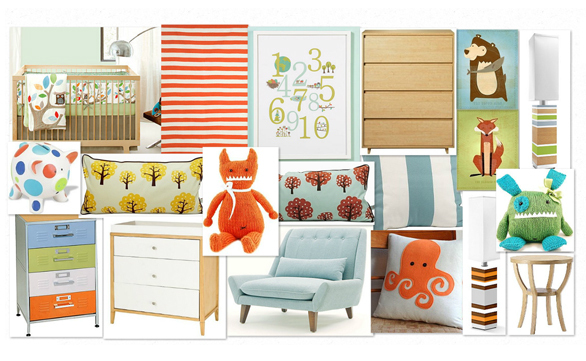 I also like nursery designs that work for both boys and girls. Who’s to say that girls like pink and boys like blue. As long as the space is friendly and inviting, it’s doing it’s job. 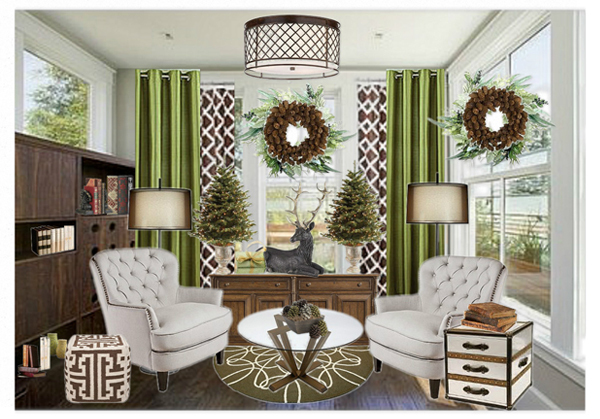 You may recognize the lamps from the last design. They are one of my new favourites. 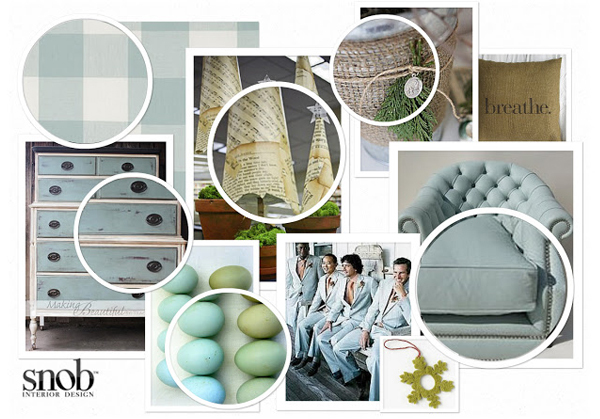 You can create your own by mixing and matching colours to fit your colour schemes.